Last Saturday we had BBQ party along Kamo River (in the North part). Our boss let me know there were people did BBQ in Sakura season. but never happened to be able to have BBQ party there. So just in case we confirmed with the department in charge of Kyoto city one day before. They said it is possible but it was public area we have to pay attention to people go through there. This was the third time to organize it together with another sharehouse management company in Kyoto Expo House. Because we are friends. Almost 50 people joined us!! 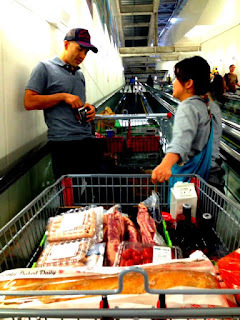 Our preparation started from one day before we went to wholesale grocery store, Costco. Because Shopping was for almost 50 people to join. It was the first time to have event for such a large of people. There are many things to be attractive there. Our mind were out of control. We could not calculate how much we need to get. So finally two shopping carts were full of foods and beverages!!!!! According to my experiences so far whenever I organized any events it has been raining on the way. But it was all days hard sunny day. We play Bing Game. The first prize was Voucher for J-hoppers pair accommodation. Soccer game on grass ground was so fun! The preparation was so long time, on the day I felt so exhausted. I did decide to have anymore. But our guests smile and how enjoyed. I forgot the negative feeling. We want to have winter joined event this year as well.